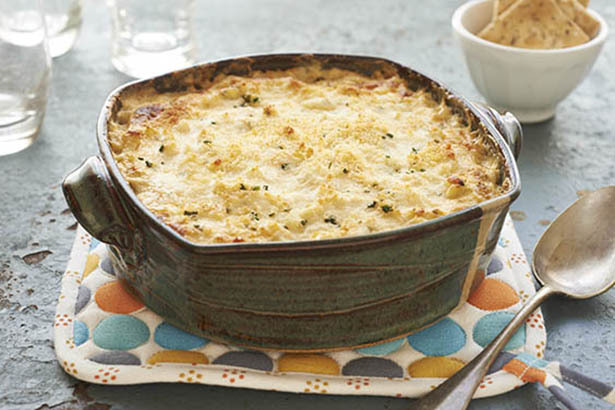 An appetizer that will go fast at any party, this warm, cheesy dip is packed full of three kinds of cheese and fresh crabmeat. Combine cream cheese, 1/2 cup Parmesan cheese, Cheddar cheese and next eight ingredients (sour cream through garlic) in a large bowl, stirring to combine. Fold in crabmeat. Spoon mixture into a lightly greased 1-quart baking dish. Sprinkle remaining 1/4 cup Parmesan cheese on top. Bake for 30 minutes or until dip is bubbling and golden brown. Serve warm with crackers and raw vegetables.